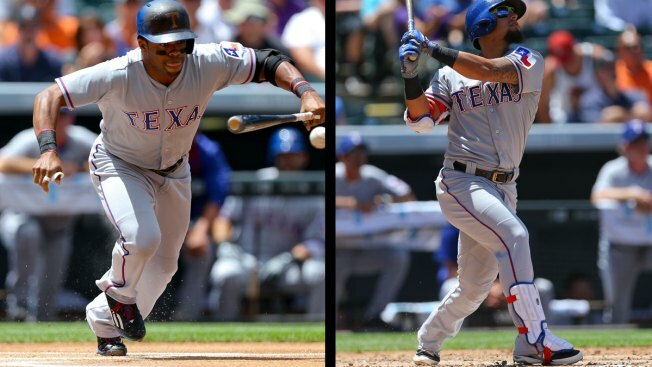 Delino DeShields, left, and Rougned Odor, right. Since the All-Star break, the Texas Rangers have played three games in Houston and three in Colorado. While the latter of those locales can always cure offensive woes, the Rangers' offense has been on a tear since the four-day All-Star break. The Rangers, despite being shut out on Sunday in Houston, have averaged 5.8 runs per game in their six games post-break. The last three in Colorado? They've scored seven, nine and 10 runs in those last three. The entire Rangers' lineup, it seems, is hot at the moment, but a big reason for the offensive explosion has been the production at the top of the order from leadoff man Delino DeShields and No. 2 hitter Rougned Odor. In those six games, DeShields is batting .346 with a .433 on-base percentage. He has two doubles, a triple and three walks in that time with two stolen bases. He scored on Wednesday after being hit by a pitch, moving to second on a sacrifice, stealing third base and scoring on an errant throw to third. His speed is a big-time weapon, which we knew all along, but his overall game this season has been a pleasant surprise. Think DeShields is going well? Well, you're right. But he has nothing on Odor, the second-year second baseman who was demoted for five weeks after an awful start and returned with a new sense of awesomeness. Odor has been on a tear ever since his return a month ago. Over his last six games, he's batting .429 with an OPS of a 1.362. In those six games, Odor has 12 hits — two doubles, three triples, two homers with six RBIs. Any time you can get numbers like that from your No. 2 hitter, you're going to be doing pretty well as an offense, and the Rangers will hope he continues his tear when they head to Anaheim to begin a weekend set against the first-place Angels on Friday.